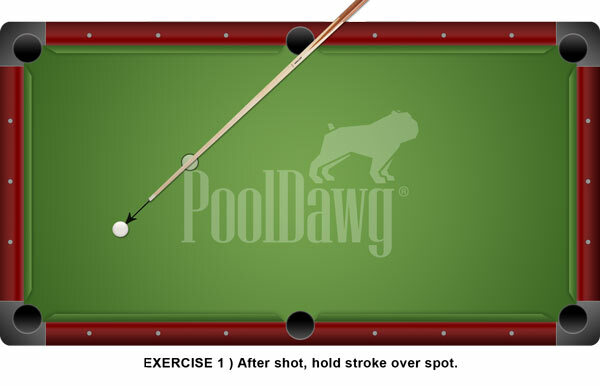 Getting back into pool after a taking a long break can be daunting. But don't worry! There are lots of ways to get back into stroke. Start by remembering that there's more than one right way to play. Pool is a highly individual endeavor and your approach to it should be too, everyone needs to find out what works for them. Also, always remember that getting back in stroke is as mental as it is physical, so don't be discouraged. Here are 4 easy drills to help improve your stroke. 1. The first thing I like to do after being away is execute a few straightness checks. 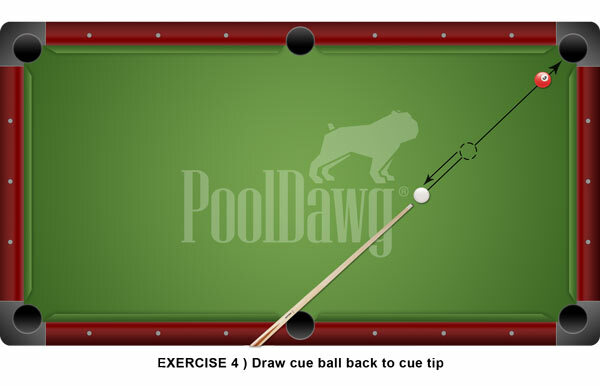 One way is to put the cue ball on the spot, shoot it into one of the corner pockets, and freeze, leaving your cue in place (Exercise 1, see below). If my follow-through isn't straight, or long enough, you'll notice. Some players prefer to do this right on top of a side rail, using the seam between cloth and wood (or formica) as a guide. And some do what they did when they were kids: practice stroking into the mouth of an empty bottle without touching the sides. Sounds menial, but 30 to 60 seconds of this works wonders. 3. 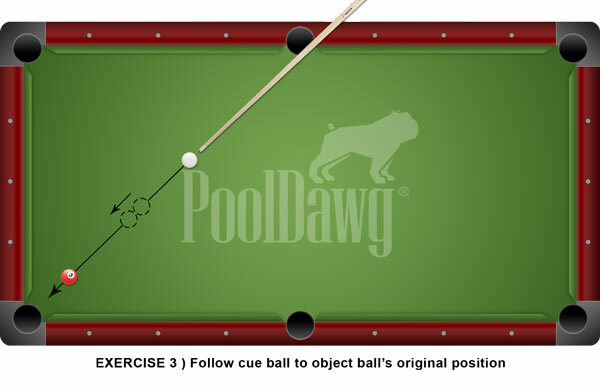 Put an object ball on the spot, set up a straight-in shot with the cue ball 14 to 18 inches away, and try to replace the spotted ball with the cue ball (Exercise 3, see below). In other words, that's one ball diameter's worth of follow, in a perfectly straight line. You will most likely accomplish this by striking the cue ball half a tip either just above or just below its center, with a little extra force. You can't accomplish this through soft-rolling the ball. 4. Put an object ball on the spot, and the cue ball 14 to 18 inches away again. 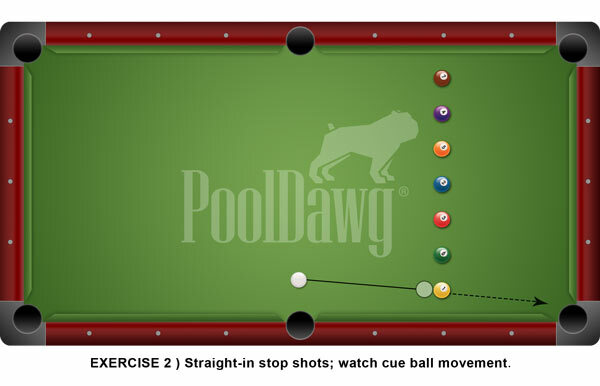 This time, shoot the ball in with bottom English, and try to draw back on a perfectly straight line so that when you re-spot the next ball, you have the exact same shot (Exercise 4, see below). Three times in a row is good; anything over that is very good.